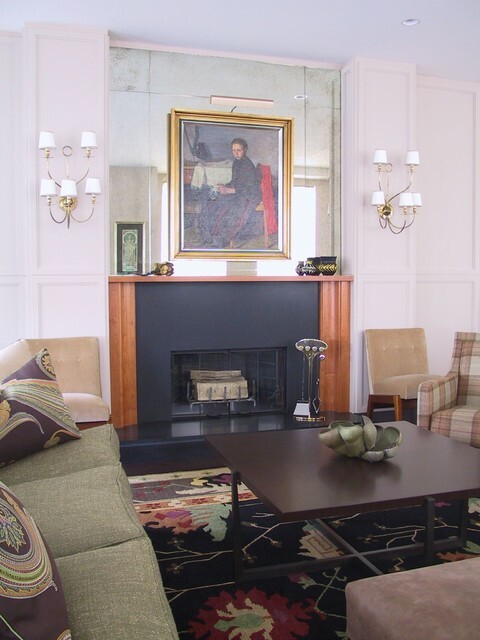 Custom fire place mantel in Cherry and black granite and paneled wall. Large sconces by Jean Royere. Art hung on mirror - I am interested in installing a mirrored wall and hanging art on it. How did you secure the art to the mirror? Wainscoting full wall - living room behind couch? So we need a very modern look to go with the antique Navy rug. I like the shown combination of sizes w large in the middle bordered by others Antique mirrored wall DR.